« Confused About the Affordable Care Act? You’re Not Alone. Healthcare.gov Explains It All. Wondering why I haven’t posted much this week? I’ve been busy making changes to the Working Well Massage chair massage stations. 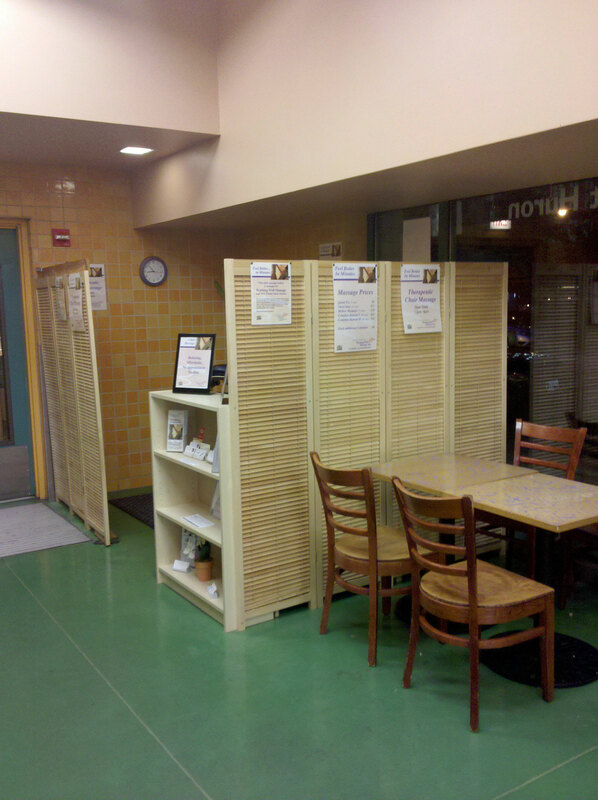 We completely remodeled our massage booth in Whole Foods Market-Gold Coast at 30 W Huron. 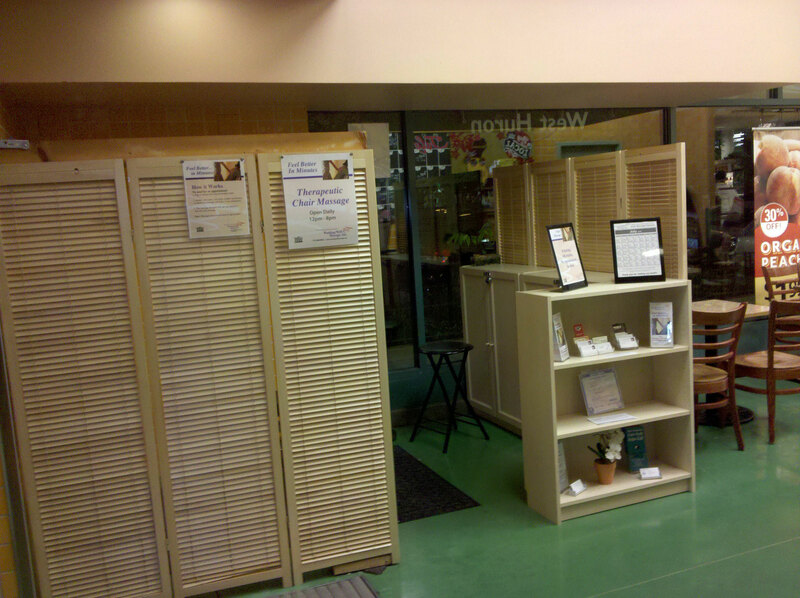 We replaced our paper screens with beautiful maple shuttered screens and new cabinets. Check out our new look below. The New & Improved WWM Gold Coast Booth at 30 W Huron. Image by Sue Shekut. WWM Chair Station at Whole Foods Gold Coast, 30 W Huron. Image by Sue Shekut. 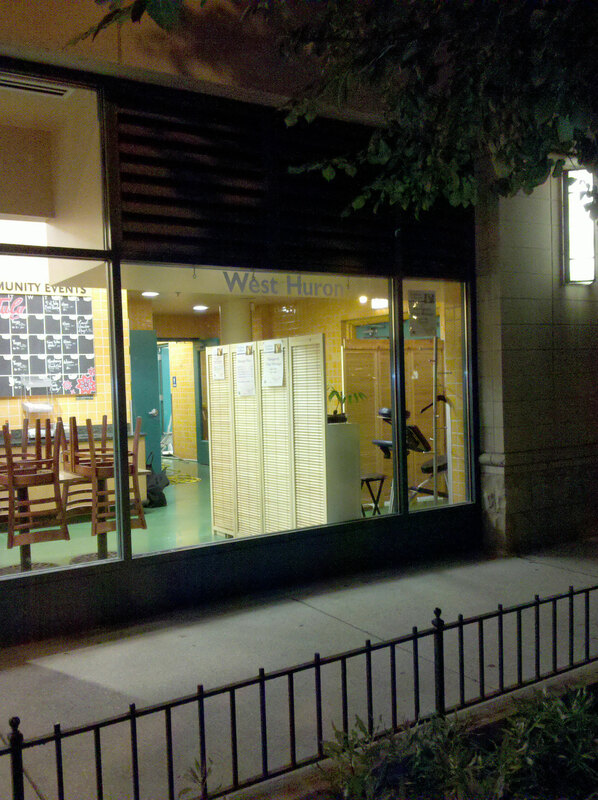 And at night you can still see our new shiny massage station outside Whole Foods Market-Gold Coast. Working Well Massage provides chair massage for corporate clients, special events and daily at our two Chicago chair massage stations. Chair massage at our WWM stations are convenient and affordable. You don’t need an appointment, you don’t need to disrobe and you decide how long you want the massage to last: 5 minutes, 10 minutes, 15, 20 or 30. But if you really need focused work on your upper body, we can even give you a 45-min to 1 hour chair massage at our booths!